The old never gave in to the new. It became superfluous. Given the life and death extremes at which medicine operates, no other human activity is of higher significance to members of society, and to society itself. Therefore, it is surprising that, instead of aligning itself with the anticipatory condition of life, medical practitioners at all levels approach health from the physics perspective of reaction and reductionism. On the other hand, anticipation—definitory of the living—could prove to be consequential if the perspective it opens would become the backbone of medicine. The study discusses the reported negative effects of healthcare and medical practice based on the mechanical model provided by physics-dominated science. Acknowledging technological progress in medicine, the study also provides actual expressions of anticipation important for the theory and practice of medicine. 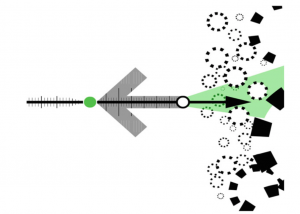 Complexity is examined as a characteristic of anticipatory systems. Lastly, the study suggests concrete steps towards an anticipation-grounded medical education. “Death by Medicine” is the alarming title of a book published in 2004 . The book is based on sound research from respected medical publications (e.g., Journal of the American Medical Association, New England Journal of Medicine, National Vital Statistics Report, among the 152 listed in the Bibliography). The 2016 study appearing in the British Medical Journal confirms these findings [2, 3]. They all bring to light some of the consequences of industrial-mechanistic medical practice. There is no denying the spectacular contribution of physicsand chemistry-based technologies in medicine and healthcare. Spectacular successes in mechanistic medicine—organ transplants, prostheses, intra-uterine spina bifida operations—have never matched the success of the anticipation-grounded polio vaccine. Proactive means and methods—e.g., herbs, teas, exercise, anticipatory diagnoses (based on odor, for instance)—were practiced for millennia in virtue of empirical observations transmitted from one generation to the next. This “self-care” helped reaction-driven medicine to avoid an even worse record of contributing to death as much as, if not more than, cancer and heart disease. Challenged by conditions beyond the traditional boundary of illness, medicine is discovering that the living is less simple than what the physics paradigm implies. Niels Bohr  acknowledged the inadequacy of physics to describe the life. Erwin Schrödinger suggested that a new type of physics is necessary to explain life . Walter Elsasser  tried to provide biology with a scientific foundation not in opposition to physics, but rather in its spirit. This study makes the case for integrating physics-based medicine and anticipation-grounded medical practice. The decisive test of understanding anticipation as definitory of the living  is medicine. It is also a meaningful test of usefulness: Why study anticipatory processes if they are of no practical consequence? In medicine, where life and death are at stake, the philosophical dispute of whether the condition of the living is different from that of the physical might be of immediate concern. Yet over time, anticipation expression of all kinds—i.e., successful actions that preserve life and help reach desired outcomes—have afforded a rich body of empirical evidence. In recent years, data pertinent to anticipatory processes have been accumulated in a variety of fields of knowledge . This evidence triggered a plethora of explanatory attempts —some anchored in science of unquestionable integrity; the majority, however, rather speculative, usually derived from ill-defined concepts or through less than grounded generalizations. In particular, the notion of “anticipation” itself is usually confused with other forms of dealing with change, such as forecasting, expectation, guessing, etc., and especially prediction. It is rarely understood that they are different in nature from anticipation . Conceptual clarity, more than instrumental obsession (so typical of this particular time) is necessary. When everything is measured—because it can be—in the hope that “big data” technology will reveal “secrets” behind the data, the expectation is that processes are reducible to data—as prediction, forecasting, guessing, etc. are. Totally ignored is the fact that actions informed by anticipation are the expression of significant data—usually “little” data, generated ahead of the action. Moreover, the emphasis in anticipatory processes is on meaning more than on quantitative descriptions based on the use of numbers. It was not an apple falling from a tree (and the equation describing it) that gave legitimacy to the law of gravity. Newton advanced an understanding of physical law that revolutionized science, and continues to have practical relevance. The same can be said in respect to the theory of relativity: Einstein became more famous for e = mc2 than for the revolutionary view of the universe that his mathematics advanced. It might be that quantum mechanics, still at the forefront of science today, qualifies as well as a revolution in thought and discovery. The fact that particular aspects of quantum mechanics (such as entanglement and non-locality) fascinate the public (and even some scientists) should not affect awareness of a totally new view of reality. Human dedication to understanding the world, within which the living unfolds, eventually crystalizes in revolutionary views—this in itself is worth celebrating. But it invites reflection as well. Nothing comparable, not even the famous DNA helix, is on record in explaining life itself. Newton, Einstein, the quantum mechanics visionaries (Heisenberg, Schrödinger, Bohr, Feynman, among others) are present— and rightly so—in the explanation (as tentative as it still is) of the beginnings of the universe. But the beginning of life is still in the fog of confusion. The attempts to start life from non-life, almost as seductive as alchemy (Newton was one of its proponents) was long ago, persist through new technologies (Venter’s claim [10, 11] is only one among many). They entail a rather disconcerting surrender, celebrated as victory: since the living itself is embodied in matter, the more physics we know—and the more physics-based biology we use—the better we will understand life. Nobody ever proved this reduction. The obsession of particle physics (i.e., know the particles and you will know all about the whole they are part of) translated into the hope that molecular biology or genetics will eventually solve all the mysteries of disease and, eventually, life. Obviously there is much more nuance to all of this. Albeit, science consists mainly of convincing physics theories and their extension into particular phenomena (chemistry, for instance). A large body of generalizations from the physical to biology converges in what seems an inevitable, but false, conclusion: the living is a machine. The material substratum is acknowledged without reservation; omitted is the understanding that the dynamics of the physical and of the living are different. Also absent is the distinct effort to advance a view of the living that defines its own characteristic causality. This might integrate the science of the physical—e.g., physics, chemistry, geology, astronomy, meteorology—without discarding what defines a science of the living proper. The epistemological effort that I argue for might even arrive at the realization that physical causality (explaining change in the nonliving) is ultimately a subset of the extremely rich types of causality that explains the change of life . A science of the living can only be holistic, because the dynamics of the living is the expression of its change as a whole over time. As already mentioned, the realization that physical causality could be a subset of natural causality might entail the need to understand “Nature” beyond Newton’s unifying view that aggregates the living and the physical and declares the laws of physics—reflecting God’s control over the universe—as universal. Eliminating God from the picture, Darwin’s Origin of Species  was celebrated as the equivalent of Newton’s foundation of physics (Philosophiae Naturalis Principia Mathematica, ). Natural selection describes the implicit dynamics of the living, of a different precision, less precise, but more expressive than that described in Newton’s equations. If the past (as a state) defines the future of physical systems, the future (as a possible state) expressed in anticipatory processes, is the vector of evolution. Determinism, the characteristic causality of physical phenomena, is also relevant to the physics of the living, even though it returns an incomplete explanation of life as change. Just to present an example along this line of reasoning: physical forces (e.g., pulls, compressions and stretching, distortions) applied to a cell can further affect it, probably more than the inherited genetic code does [18, 19]. Taking both physical forces and the genetic code into consideration affords an understanding of cell changes that neither can deliver alone. Non-determinism, describing a relation between cause and effect offering a multitude of possible outcomes, pertains to change as an expression of something being alive. Indeed, changes due to physical forces applied on cells (e.g., a cut or a blow)2 and genetic processes governing all dynamics are interwoven. There is no way to unequivocally predict whether the cell becomes cancerous or simply divides in a process of self-healing. De la Mettrie’s man-machine metaphor , to which science since 1748 remains literally enslaved, is but one consequence of a rudimentary view of causality. Only since the advent of quantum mechanics was this view somehow questioned. Stochastic aspects of dynamics were introduced, and indeterminacy accepted as a qualifier for processes less than very precise. Everything that can be fitted to the time series describing the functioning of a machine operates under the expectation of perfect repetition—even though the living is the domain of “repetition without repetition” , i.e., non-monotonic change. The question of legitimacy, as it pertains to the anticipatory perspective, transcends the theoretical. It has consequences for the way we conceive of means and methods for maintaining life: the domain of medicine. To know how the physical (i.e., nonliving entities) changes is to infer from a quantitatively described past state to a future state, under assumptions usually defined as initial conditions (also expressed numerically). To know how the living changes is to integrate inferences from past states with interpretations of the meaning of possible future states. No falling stone will get hurt (not to say die); a living falling (cat, human being) can get hurt (and even die). The framing of change within the respective consequences, not the same in the physical and in the living, is key to understanding their difference. The causality specific to interactions in the physical realm is described in Newtonian laws—action-reaction, in particular. The causality specific to interactions in the living includes, in addition to what Newton’s laws describe quantitatively, the realization of meaning in connection to the possible future, i.e., anticipation. Falling on ice or landing on a hot surface are different not in the physics of the process of falling, but in the meaning for the living, that is, the consequences. Evidently, this is pertinent to the hope that understanding change makes possible its description ahead of time, before it actually takes place. For this purpose, physics seeks descriptions, usually in mathematical form, similar to the human construct called law: a rule to be obeyed by those adhering to it. The laws of physics encapsulate descriptions of change that are necessary by nature. The fact that the living, in addition to the constraints of physics, is subject to contingent rules of behavior is usually brushed aside. Reductionism postulates the identity of the physical and of living, to the detriment of a better understanding of the dynamics of the living. The same takes place within the epistemology based on the machine metaphor. Karl Popper [21, p. 224] noticed that in this sense, “…the doctrine that man is a machine has perhaps more defenders than before among physicists, biologists, and philosophers, especially in the form of the thesis that man is a computer.” Popper (otherwise an over-rated, opportunistic philosopher) was either unaware of, or unwilling to embrace, the even more radical view of Newell and Simon: “Men and computers are merely two different species of a more abstract genus called information processing systems,” [22, p. 234]. Machines, regardless what kind, (from clocks to hydraulic pumps to engines to computers), are constructs meant to function in a predictable manner. Humans make them. If religion postulated that the human being was created in the image of the Creator, machinomorphism establishes the religion of the human being made to function like the machines humans conceived. It is a solipsistic view: the making of something (e.g., machine) is the proof of the equivalence between the makers and the made. As already mentioned, for Newton, the mechanism of the universe, whose dynamics were precisely described in his equations, was the proof that everything in this universe behaved, at God’s will, like a mechanism. If the clouds (Popper’s metaphor) “are highly irregular, disorderly, and more or less unpredictable”— examples are molecules in a gas, or gnats—clocks are precise and predictable. Still, for determinists, clouds are clocks. In their view, with enough knowledge, what appears as indeterminate proves to be as determinate as the universe, or as the structure of matter. The language describing their functioning is mathematics built upon the construct we call numbers, which ultimately describe quantities. The automation of mathematics (or at least part of it) through computation gave this tendency a new, more specific, though ultimately illusory, viability. Machines embody the cognitive construct of numbers, i.e., descriptions of quantities. They are representations of the human activity that the machine replaces or augments. The arm and the lever used together to move objects is one simple example. Like any representation, they are, by their condition, incomplete . To ascertain that a representation—the machine—is identical to the represented makes sense only for entities with clear boundaries. A billiard machine is equivalent to a billiard table in which, given the initial and boundary conditions of the billiard balls, the characteristics of the table (size, texture), we can, using the laws of motion, “calculate” the game. Laplace  was sure that given the positions and the momenta of all particles in the universe, we could, using Newton’s laws, fully describe the past, present, and future of the universe.3 After all, the universe as a clock, i.e., a machine, is what physics-based determinism ascertains. But a pump is not equivalent to a heart. For extreme conditions—entailing a number of serious limitations—a pump might be used in order to help resuscitate someone, or extend someone’s life—usually in an impaired mode. Moreover, the dynamics of the human being transcends expression in differential equations. Actually, not only isn’t Laplace’s deterministic view inadequate for describing life, but worse, it leads to aberrations. The fact that biology, and medicine in particular, took the deterministic path is understandable. Explaining away what we don’t fully grasp is easier than assuming the responsibility to seek alternatives. Moreover, simpler explanations afford the immediacy of practical methods, sometimes informed more by urgency than by anything else. The anticipatory perspective is the alternative—a new Cartesian revolution . But it is not as comfortable as the beaten path of physics and its promise for technology. It took over 200 years (more precisely, since Newton, Descartes, and Laplace) for scientists and scholars to realize that the beaten path at best offers partial answers (often wrong) to the question of what change means in the living. One cannot expect abrupt abandonment of the huge investment (time, energy, money, human lives, and the lives of animals used in experiments) in following the wrong path. Against the background of scientific advancement, we can hope for a shorter time for ascertaining a complementary view, and to start applying it to situations for which physics-based medicine is not adequate. The aging of the world population is only one aspect; the degeneration of the species—expressed in, among other ways, systemic disorders and debilitating spectrum conditions—is probably an even more critical problem. The punch line (Can you do it while it’s running?) only pushes the mechanistic view that has shaped modern medicine to the extreme. Within the same view, the annual check-up can be interpreted as the equivalent of the manufacturer’s requirement: scheduled maintenance every 5000 miles and a fluid change (Fig. 1). It turns out that what makes sense in extending the life of the car’s engine, or of the car in general, is at least debatable when it comes to the human being. Modern car maintenance facilities are equipped with automatic diagnostic devices. There are many who believe that the same can be done with the human being (and with pets). The physician becomes a mechanic. The “Precision Medicine Initiative”  is based on this belief and promotes medicine as a form of engineering. It emulates the control mechanism model of engines endowed with sensors and extends it to the individual, claiming that it will eventually lead to individualized medicine. Reducing the use of annual physicals could also save money and time. Though on a per-visit basis, the annual physical is not costly, it is the single most common reason that U. S. patients seek care, and cumulatively these visits cost more than $10 billion per year — similar to the annual costs of all lung-cancer care in the United States. Reducing the number of physicals could free up another societal resource — primary care providers’ time. Approximately 10 % of all visits with primary care physicians are for annual physicals, which might be crowding out visits for more urgent health issues. Poor access to primary care has been cited as one reason why patients seek care in emergency departments for low-acuity conditions. Finally, there are large societal costs to asking all 220 million adults in the United States to spend several hours of their lives each year traveling to and waiting for care, when they could use that time productively elsewhere. Given this evidence base, it appears unlikely that annual physicals in their current forms lead to any substantive net clinical benefit. Missing from the list of arguments is the understanding that medicine as applied physics will continue to be expensive, ineffective, and confusing. The brutality of the “spare parts” understanding of medicine is not only limited to the procedure and the rehabilitation (under heavy use of painkillers that affect overall health), but also to the undermining of whatever health the patient still had before the intervention became necessary. Medicine, in its industrial procedures, “heals” today and produces invalidity of deeper levels tomorrow. Arguing in favor of descriptions appropriate to the functional behavior of biological systems, Rosen  stated that such descriptions “bear no simple relation to the structural observables which our physical technique can measure.” Without reproducing his arguments here, let us take note of the fact that the scientific methodology of fractionating—break what is complex into simpler subsystems— does not even apply universally to the physical. The three-body system problem, notoriously unsolvable, could be fractionated into a variety of two-body and one-body systems. But this does not ultimately produce the knowledge we need to understand the dynamic characteristics of the initial system. Fractionation does not afford the information we seek—and from a holistic perspective, it does not afford any information. All the media-hyped information on genetics that spurs hope in patients (see Garzoni, Centomo, Delledonne4) is the result of ignoring a simple principle: health, or its deterioration, is a matter of the whole. Some healing processes can be triggered through identification of what might have caused an imbalance, but only if the fractionation transcends physics and chemistry. Unfortunately, modern industrial medicine is based on a view of the living and of health grounded in physics, and sometimes chemistry. It treats the condition called “disease” with medication and surgery: a cause-and-effect sequence within a reductionist view. Even physical therapy is practiced in this spirit. From a logical perspective, specialized medicine—which reports spectacular successes never to be underestimated neither in price nor in helping patients— collides with the holistic understanding of what health, or even disease, is. Every year, the medical community celebrates the ten (or however many) greatest accomplishments. There is no way to avoid the feeling of awe. Human lives are saved under extreme conditions and amazing interventions of all kind, some involving new drugs, genetic medicine, prostheses, and highly complicated procedures. The word “miracle” is the first to come to mind. But there is also the dark side, where numbers of a different kind—such as incorrect diagnoses, botched surgeries, questionable medications (to name a few)—add up. Adverse reactions to prescribed drugs (in the millions), needless procedures (close to eight million a year), unnecessary hospitalization (close to 10 million) are documented with the aim of establishing some quality control criteria. Antibiotics—once the miracle treatment for infectious disease—and opioids (hydrocodone, oxycodone, fontanel, codeine, among many others) are rapidly becoming a curse  affecting the genetic profile of the entire population (not to mention effects on the environment). It is impossible to predict the long-term consequences of this situation, produced by those who dedicated themselves to serving life, not undermining its viability. Such examples evince the resistance to understanding healing within an anticipatory perspective. To maintain an individual’s viability in the context of change (e.g., aging, styles of work) is quite different from repairing abused bodies within the framework of a mechanic’s shop. – Did you lose them here, around the lamppost? – Then why are you looking for them here? – Because I can see better?there’s more light around the lamppost. The internist takes note of higher blood pressure, the cardiologist prescribes pills (Losartan or Lisinopril), a psychiatrist addresses a stress situation, a practitioner of alternative medicine recommends red beet juice, a Chinese healer initiates a course of acupuncture—each one looking around their own lamppost. In the absence of a meaningful understanding of change, as it pertains to health, this kind of medicine has a very low predictive performance. Indeed, it is quite surprising that no one seems to notice that while the prediction of physical phenomena is rather successful (and getting better), once the same view is applied to the living, the performance is low—not far from the threshold of sheer guessing. Therefore, despite all the statements to the contrary, medicine driven by physical determinism has a very disappointing proactive success. For example, tumor–patient–drug interaction remains quite ill defined. Consequently, treatment success in oncology remains low, despite the enormous effort of all involved. While cancer settled in as the main challenge to medicine, only rarely are alternative treatment methods considered. Heart disease belongs to the same area of reductionist-deterministic medicine marred by failure, despite the awareness of its terrible consequences. These preliminary notes suggest a conceptual context for framing the discussion of issues in anticipation and medicine. We have to take into account that the notion of anticipation is used currently in medicine with a very precise description attached to it. Anticipation describes a genetic disorder passed from one generation to another, each time at an earlier onset (the so-called trinucleotide repeat disorders, such as Huntington disease, myotonic dystrophy, dyskeratosis congenital, etc.). The operational definition of anticipation advanced in this study explains, after the fact, the choice made by medical practitioners in trying to understand how the trinucleotide repeat occurs and what is involved in the production of the mutant protein. Nevertheless, the expression of anticipation is such that it covers the entire life of the individual: from conception to death. In the context of a study that bridges between anticipation and medicine, my goal is to point to the variety of forms through which anticipation is expressed in action. The various phases of the sexual act, pregnancy, birth, etc. are only one example for the argument that medicine is consubstantial with anticipatory expression. Medicine states that the variety of processes associated with creation—sexual act, impregnation, pregnancy, giving birth, nurturing—can be fully explained in terms of brain activity, the neuro-endocrine systems, hormones, and the like (each taken independently). Before revisiting some of the processes, let us take note of the concrete instantiations of the fundamental thesis I advance: Anticipation, in the sense defined in this paper (see Fig. 2) is definitory of the living. This assertion is connected to yet another thesis: The living is that which reproduces itself: it is its own efficient cause. Rosen’s formulation, in reference to Aristotle’s typology of causes, is “A material system is an organism if and only if it closed to effective causation” [29, p. 144]. Evolution, as it describes natural selection in the context of change, acknowledges sexuality as it relates to reproduction. The human being, in the new nature it made for itself, added to the reproductive impulse sexuality as a goal in itself, most of the time disconnected from reproduction. This defines the human in contradistinction to the rest of the sexually reproducing living. Some of the processes identifiable in the human are not identifiable in the rest of sexually reproducing nature: for example, the cultural aspects of pregnancy and giving birth. Sexual attraction and the sexual act engage the being’s totality. If, according to models inspired by the analogy to the machine, the organism were in a state of Fig. 2 Anticipatory process: The deterministic arrow of time from a past cause to a present effect and the complementary arrow of time from a possible future to the current state of the system equilibrium, sexuality would throw it entirely away and result in changing all parameters of physiological, cognitive, endocrine, etc. activity. In such case, to even entertain the suggestion of homeostasis  is close to absurd. (Bernard suggested this in 1865; Cannon  gave it the label in 1926). Think only about how blood pressure changes from one moment to another. The alternative—allostasis —hypothesizing that the brain takes control and acts in anticipation is more adequate in characterizing the dynamics of the living. The anticipation of all that the sexual encounter affords (at times in extreme forms) is not explicitly the reproduction, but the triggering of a process leading to it. Hormones associated with pregnancy (those otherwise not present) influence the process. The future organism has to be “shaped” in such a manner that it autonomously distinguishes between beneficial and detrimental factors. For example, the placenta expresses an enzyme that prevents exposure to material corticoids. In their details, these processes are of extreme subtlety. During the initial phase of pregnancy, the mother herself “functions” in a manner that protects the forming of the new living entity. It is life from life, but in a context where what is good (or at least not harmful) for the mother might be dangerous to the fetus. Danger itself is implicitly acknowledged as immediate or pertaining to malfunctions in the future. Susceptibility to metabolic imbalance, of the future living, is a long-term projection that leads to anticipatory action to prevent it. Once again: anticipatory processes, being non-deterministic, some succeed (in balance, the majority), some don’t (and there is a lot of evidence to document failed anticipation). Doctors advise pregnant women that their diet influences the entire development of the fetus. The hypothalamus pituitary adrenal activity protects the woman from stress (psychological or physical). This protection is limited in time and is related to neuronal activity. Physicians claim to have evidence that progesterone levels in the pregnant woman’s brain are higher: “There is 51 to 40 times more progesterone and estrogen marinating the brains during pregnancy” . They also report on inhibitory activity in the hypothalamus, triggered by allopregnanolone. In non-pregnant women and in men, natural opioids amplify responses to stimuli. In pregnant women, the effect is inhibitory. (Naloxone, on whose basis the drug used to treat opioid overdose is designed, plays an important role in the process described above.) Maternal oxytocin provides a control mechanism in lactation; it promotes parturition (triggering contractions of the uterus) and affects what are described as emotional states. Anticipatory expression in this case is connected to neuro-cortical activity. The manner in which oxytocin is secreted (from the posterior pituitary) is associated with the distension of the birth canal or by sucking. Birth through the birth canal is favorably influenced by the specific biome populating it. 1. 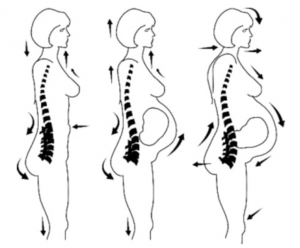 The body of the pregnant woman changes in anticipation of the pregnancy load (Fig. 3). 2. The physiology changes ahead of the many challenges related to the woman’s body and the integrity of the fetus. 3. New processes never before experienced are made possible (the process of contraction or the sucking rhythm described above) in advance of their actual need. 4. Lactogenesis is an anticipatory expression timed to the various phases of pregnancy (early, mid-term, final, i.e., prepartum). Endogenous opioids inhibit some neuronal activity and thus facilitate prolactin activity. 5. Maternal behavior—a term used to describe how a mother’s actions (preparations of all kind, nursing, cleaning, etc.) is affected by hormonal priming of the medial preoptic area. Oxytocin, estrogen, progesterone, prolactin are released in various areas of the brain, in particular the amygdala, which is associated with anticipatory activity. Maternal behavior changes as pregnancy advances. For instance, the activation of oxytocin release processes at giving birth diminishes anxiety but can lead to aggressive behavior (for the management of which pregnant women are sometimes, against the natural course, subject to medication when self-control is not enough). No doubt, medical experts could provide more details. They discuss a variety of other phenomena related to the creative act we call giving birth (i.e., reproduction). Not discussed is the nature of the very rich and sometimes ambiguous processes that aggregate in pregnancy. A recent study, for example, brings up creatine—an intracellular metabolite partially derived from diet, but also endogenously synthesized. As proved through experiments, the fetus is a “taker” of creatine . Likewise, senescence (which Rosen studied to a certain degree) is the expression of “exhausted” anticipation. But we shall not enter into the details here. The key to a successful conversation is not the passion of the arguments—and as far as medicine is concerned, it is almost impossible to exclude passion—but the clarity of concepts. Therefore, within the conference to which this volume bears witness, I took it upon myself to define the concepts. Only once we agree upon our understanding of what words mean can we debate whether anticipation is or not significant. Those who practice medicine, and even more those who contribute to a science of medicine meant to overcome the limitations inherent in generalizing physics (and the notion of machine) in the living domain will agree on the need for conceptual clarity. The current state of an anticipatory system depends not only upon previous states, but also upon possible future states. The diagram and the definition do not express the holistic view, which entails the fact that the reductionist method will always return a partial understanding of the process. Indeed, health, as well as loss of it, is the expression of the whole called human being, the physical embodiment (of the biome shadowing it) and the spiritual expression of the non-physical state (consciousness, preparedness, self-control, etc.). Affecting as little as one cell’s condition, or that of the viruses, microbes, and bacteria making up the biome, might, under certain circumstances, trigger a multiplicity of processes, some of extreme consequences, others of episodic nature. For the sake of the argument, let’s take Methicillin-Resistant Staphylococcus Aureus (MRSA). As it is already established, MRSA, caused by the staph bacterium, can affect people who have spent time in “health factories” (e.g., hospitals, nursing homes) or at “health shops” (like dialysis centers). Invasive procedures, such as surgery, intravenous tubing, implantation of artificial knees and hips, and kidney and heart transplantations can trigger infections that prove to be resistant to antibiotic treatment. Physics-based devices of all kinds—all the gadgets and engines we use—also get “sick,” that is, they malfunction. But the rate of success in fixing machines is as high as it can get, while the success rate of healing is increasing only slightly (despite the spectacular successes of extremely complicated cases that the media report). The idea that medicine’s fundamental perspective might be deficient has not led practitioners to question it, and has not resulted in a vigorous attempt to change it. 2. Those dedicated to research of anticipatory processes will deliver clear assessments of practical consequence to their colleagues in healthcare. If both are realized, medicine will change. Otherwise, it will take a deeper crisis than the current one before medicine progresses from reaction-driven physics-based practice (“fixing” the patient) to a proactive, anticipation-based dedication to the well-being of the whole person. Anticipation-based medicine implies a number of possibilities. As opposed to reaction, which is usually swift and short, anticipation unfolds within the timescale of the process involved. The immune system is anticipatory. Vaccination is designed to engage the immune system in order to avoid certain conditions (e.g., the success of the polio vaccine). Its components (antibodies, white blood cells, lymph nodes, T-cells, bone marrow, spleen) evolve according to the specific dynamics of the bacterial and viral expression they address. Nothing is immediate. The possible infection—a future state that the organism would rather avoid—is identified before onset. Immunotherapy is still in its early stages; but it is the closest we have come to an anticipatory perspective in medicine. Among others, Miroslav Radman, expert in DNA repair, alluded to the anticipatory characteristics of the immune system. A knee replacement —of course, sometimes necessary within medicine’s emergency model—takes less time to be performed and become the “new knee” than what genetic healing—still more a promise than reality—might one day take. Mechanical interventions introduce the clock of physics where in the reality of the organism many time scales exist. Is there one identifiable overarching reason for the reductionist-deterministic path taken by medicine? Someone dedicated to understanding anticipatory processes will not be among those searching for the one reason, where evidently many factors are involved. If we agree that anticipation is couched in complexity , one consequence cannot be avoided: as a result of medicine’s surrender to the physics, both medicine and the patient suffer. Indeed, life is the expression of the complex nature of the living. Claude Bernard (1813–1879), iconic figure of modern medicine, echoed Descartes when he wrote, “When faced by complex questions, physiologists and physicians ? should divide the total problem into simpler and more and more clearly defined partial problems” [36, p. 72]. In the same spirit, Francis Crick postulated, without any proof, that, “The ultimate aim of the modern measurement in biology is to explain all biology in terms of physics and chemistry” . This thought continues, “Consciousness and mental states can be reduced to chemical reactions that occur in the brain,” [38, 39]. Arguing from examples—how often do physicians err in reducing a problem to a smaller one, or how many times the physics and chemistry were right, but the patient died—is at best spurious. The broad image of medicine in these days of spectacular scientific and technological creativity is such that even those inclined to defend its record are not necessarily free of doubt concerning its progress. We landed on the moon, an immense achievement based on physics and chemistry. But we don’t know how to handle the flu. (Vaccination is successful at the 50 % level, which is more a qualifier of guessing than of prevention.) We stuffed medical offices with expensive technology and provided the physician with data acquisition and processing capabilities of unprecedented precision. But we still don’t know why a patient in a coma might be brought back to consciousness with Zolpiden (a sleep-inducing drug). To repeat, arguing from examples does not lead to knowledge, rather to questions. These are the outcome of the daily activity of each physician. Very few cases are as clear-cut as the patient, the insurance, the doctor, and society would like them to be. Medicine is about life—such as in assisting a woman in giving birth—but also about what happens when life is subject to change (beneficial or detrimental), when life comes to an end. Physicians cannot avoid seeing themselves in each and every patient. The art and science embodied in the practical world of medicine is the necessary result of the condition of the living. If medicine were like physics or chemistry, society would be entitled to expect perfection. If, to again quote Bernard (justifiably admired for some of his work), “A living organism is nothing but a wonderful machine,” we would seek the better mechanic and work on an automated machine-full body diagnostics (which is already in the works, beyond the latest mobile device apps). The dialog between the “mechanics” of human health (the engineers) and those trying to perceive it from a different perspective—healing as art and science— ceased. The Anticipation and Medicine conference I organized is one of the very few where at least an effort was made to bring together those who would criminalize, rather seek advice from, each other. To make dialog possible, a question was addressed to all: Why does the same patient prompt many different answers from different practitioners of medicine? Competence level plays a role here, as do the means used for diagnosis. Culture is important, too; so are the social, economic, psychological, and religious conditions. But even assuming some common denominator—well-trained physicians, good technology, relatively stable societal background—the assessment continues to vary. Depending upon the condition examined—from flu symptoms to a variety of inflammatory conditions, from diabetes or asthma to all kinds of insufficiencies, and up to heart disease and cancer—the variability of evaluations is astonishing. It speaks in favor of the profession that patients are sometimes advised to seek a second opinion. More and more doctors interact, consulting with each other. Still, as opposed to the mechanic (convinced that he does what a medic does), who gets it right because the knowledge domain is limited—and there is no room for ambiguity —physicians, themselves changing as they examine their patients, deal with a subject that does not stay still—not even in a state of coma. The patient is an open system, of a dynamics no physical entity comes even close to reaching. Health (or lack thereof) is an expression of the complexity that defines the living. The meaning of the word (its semantics) is as well-defined as that of health. Leibniz  seems among the first to examine science from a complexity perspective. In his view, laws should not be arbitrarily complex. If they are, the concept of the law becomes inoperative. Medicine seeks simple definition for medical conditions, so that doctors can use them without difficulty. PoincareÌ , and, closer to our time, Prigogine  expressed interest in prediction (relation to future) as it is related to complexity (they are mentioned in connection to “chaos” theory, i.e., dynamic systems theory). From the anticipatory perspective under examination here, Rosen  remains the closest reference to the complexity intrinsic in living phenomena. In his view, there is no largest model for complexity. A complex entity is not fractionatable. (For more on this topic, see Staiger et al.5 and Louie .) On the pragmatic level, where medicine is anchored, complexity is associated with efficiency, in particular, efficient treatment—regardless in which form. Patients are not known for patience (no pun intended), although many end up dependent upon life-long treatments. The reductionist-deterministic model, useful in conceiving chemical means (i.e., pharmaceuticals) of extreme efficacy, is an expression of the attempt to understand which representations of a disease, that is, which symptoms, are easily addressable. The goal of explanations—e.g., how aspirin works—that is, measurements performed to find out which processes are triggered by some medications, under the guidance of reductionism and determinism, is to gain access to knowledge about phenomena otherwise difficult (if not impossible) to explain. “What is a headache?” is such a phenomenon (as common as it is different in its variety). The reductionist-deterministic paradigm indeed led to significant technological and pharmaceutical progress. But this does not eliminate the need to define complexity. 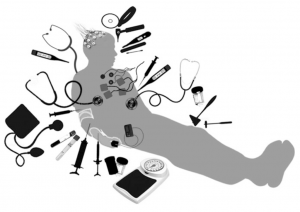 A clear criterion (or criteria) for identifying it is more urgent than ever before if we want medicine to overcome the limitations inherent in its mechanistic practice. So far, the focus has remained on scale, i.e., on quantity, while complexity actually defines quality. However, complexity, as consubstantial with the living, is of high-order consequence for medicine. If the living, in particular the human being, is complex, knowing the medical subject in its complexity is of practical importance. (In a different context, I introduced a more general understanding of complexity as it relates to the human being .) In what follows, the concepts will be summarily defined and related to medicine. This relatively simple text is based on Gödel’s magnificent work of 1931 . His subject is not the world, not Nature, but the dyophantine number theory, i.e., arithmetic—as far as one can imagine from the work of a physician and surgeon. However, the logical representation justifies the generalization from labels used in the description of the world (numbers) to existence. Gödel ascertained, and demonstrated, that some of our descriptions cannot be simultaneously complete and consistent (Fig. 4). The doctor acts on partial descriptions. These can be symptoms easily noticeable even upon superficial examination, or based on elaborate measurement. In the last ten years only, the number of measurements that technological progress has facilitated has increased by many orders of magnitude. A high degree of sophistication is reached in discriminating among many parameters, some interrelated (but of variable interconnectedness), others incidentally correlated. To assume that the practitioner, who examines thousands of patients, tries to keep abreast of the most current knowledge in the field, or can keep pace with it, is naÃ¯ve. Technology-facilitated data acquisition is way ahead of our full understanding of its means and methods. In the end, the attempt to fully describe, through data, change in the living might never succeed. An open system cannot be fully characterized. Even if it could, that will not change the fact that full description and consistency are reciprocally exclusive. This is so because phenomena of G-complexity—to which the dynamics of the human condition belongs—escape both reductionism and determinism as exclusive descriptions of their causality. There is no effective decomposition rule; the consistency clause ascertains that inferences implicit in determinism (same cause ? same effect) do not hold for the G-complex. There is no medical practitioner who has not experienced this. Nothing is cause-free; rather, in the living causality is expressed in forms that no longer submit to the time sequence characteristic of determinism. Capturing the dynamics of life’s physical substratum, determinism and causality, together with non-determinism and a-causality (i.e., within a condition of complementarity, as Bohr defined it ; see also Nadin6) afford a more adequate understanding of how life is expressed. 1. If decidability is the precise criterion for G-complexity, it follows that medicine either settles for the domain of the complicated (a heart transplant, a knee replacement) or triggers natural processes, such as genetic-driven methods of repair and self-repair. The knowledge domain of medicine is the undecidable. Above the threshold of complexity, there are no degrees. A system is undecidable or not. If treated under the complexity threshold, the system is equivalent to any physical system—and the criteria for maintenance correspond to this condition. There is no room for equivocation. If treated at the complexity level, healing and self-healing, i.e., the repair function, (which is anticipatory) imply processes characteristic of the living. It is encouraging that medicine is making serious efforts to become more “natural,” to align its means and methods with the subject of its concern. Immunotherapy was already mentioned as an example. 2. A G-complex system is characterized by the fact that its information level is always higher than the information received from the environment; that is, a G-complex system generates information. Every patient becomes part of the interaction called treatment. In physics-based interventions, there is only one answer, and therefore this co-participation is minimal. The space of possible futures is where patient and physician can actively search for plausible answers. What a physician “takes in” from medical education (pre-med, residency, research fellowships) is quite different from what, on account of creativity (itself based on interaction), is expressed in the practitioner’s activity. If only the effort of individualization were to be considered, this would already confirm the idea. Anticipation-driven medicine is by necessity individualized, because the living is infinitely diverse. All machines are the same; no two persons are. All electrons are the same; no two cells—from as many as the ca. 37 trillion making up the human body—are. 3. G-complex systems are adaptive systems; physical systems are defined by sameness; that is, they are not affected by context. For medicine this means the understanding that disease itself is related to adaptivity. Moreover, the agents of illness (microbes, viruses, food-born pathogens) are themselves adaptive. Medicine fails when it ignores the complexity of these concurrent processes. The consequences of the deterministic use of antibiotics were brought up; so was the vicious cycle that generated the current opiate addiction (and the mortality associated with it). 5. G-complex systems have no effective copy procedures; everything in a G-complex system is unique. The knowledge domain of entities and phenomena characterized by G-complexity is the idiographic.7 For any such entity Ei—let’s say a patient complaining about back pain, always different from any other, no two back pains are the same—we can define a functional dynamic. Take note that the function is entity specific (fEi). The simple equation says that the state of the patient experiencing pain depends upon some parameters—let’s say a certain movement—and the interaction of the patient in the context. Interactions (IEi), part of the dynamics, are also specific. The fact that the function is entity specific excludes generalizations. Evidently, the specific dynamic of one identity actually differs in indeterminate ways from the dynamic of any other entity. The aggregate value is therefore meaningless. G-complex entities do not accept nomothetic8 descriptions. 6. G-complex systems are relational. Living entities are interrelated. Medical assessments that take relations into consideration have to acknowledge their variety. An easy illustration is the state of a pregnant woman and that of her husband; so is the parent-child relation. The mirror neurons represent a good example of how relational aspects are expressed. The relational nature of the living translates into practical considerations in the process of medical assessment. It is never the case that a symptom can be examined independent of the relational space in which it manifests itself. Physicians actually report on such factors when they seek correlation: patient’s state, family relations, medical history of those constituting the patient’s milieu, etc. 7. G-complex systems are endowed with self-evolving anticipatory processes in which past, present and future are entangled. Patients embody their history; the future, related to possible interactions (some beneficial, others detrimental) is continuously anticipated. The preparedness of each person is a matter of record, not a dreamed-up hypothesis. Aging, for instance, is the example of the organism’s preparing itself for a new state. For healthcare, the anticipatory endowment should translate into awareness of the practical consideration informed by the shared awareness of both the patient and physician. Again—not as an example, but illustration—the changed metabolism associated with aging suggests a different diet, but also an appropriate program for maintaining physical condition. The fact that doctors, eager to “keep the machine going,” increasingly overwrite the self-evolving anticipatory process is probably a matter of medical ethics. Age-defined “infertility” has its own significance. A woman’s giving birth at age 60 (with the help of fertility drugs) might give her doctor reason to be proud of the performance. However, in the perspective of time, this performance will probably not make anyone happy. Medicine should not compete with machine and drug-enhanced sports for performance that goes against the condition of the living. A G-complex system is an evolving record of entangled (not quantum entangled, though) past states, current states, and possible future states. For the observer, such as the house physician, the patient’s actions are the expression of successful or failed anticipations. G-complex systems are open systems, of unlimited dynamics. Medicine ought to comprehend the non-deterministic nature of both health and disease. “I smoked and drank all my life and lived to be over 100,” expresses what we are referring to (obviously in extreme form). Others pay dearly for being only subjected to second-hand smoke. Complicated systems—such as a replacement knee or a mechanical kidney—are made of simple systems, or can be reduced to a limited number of simple systems. Complicated systems are subject to observation and measurement: the surgeon must inspect the integrity of the implant. To know such a system is to capture its regularity, obvious or hidden. This regularity corresponds to the laws predicting the behavior of such systems: eventually they will have to be replaced. 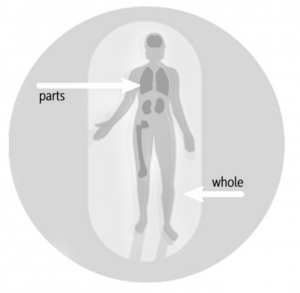 The experimental method as a source of knowledge about the physical—How do such devices perform? What are the consequences for the rest of the body?—is based on the assumption that competing explanatory models (i.e., hypotheses) can be empirically tested. These considerations apply as well to the validation of chemical interventions (e.g., pills, lotions, ointments, injections of fluids). Experiments are always closed systems, within which variability (of parameters) can be quantitatively described. The dosage for a medicine is such a variable. It is reasonable to rely on them for knowledge acquisition when the dynamics examined and the experimental timeline are congruent. Given the expectation of not doing harm to the human being, many experiments are performed on living substitutes (mice, rats, pigs, monkeys) or on simulations (digital or otherwise). The former case is more realistic, although it implies an equivalent of a sort between the human— who acquired self-awareness—and animals—complex entities, but lacking self-consciousness. There cannot be complete information about a G-complex system, i.e., about a living entity, since it produces information as it evolves. The living adapts to a variable world, and interacts with it. Life is interaction. Therefore, the experimental model pertinent to the domain of the decidable (we can fully describe, contradiction-free, the physics and chemistry underlying the existence of the living) is not applicable in the G-complexity domain. To repeat: no two individuals are the same, no two medical conditions are identical. The fact that experiments are carried out and presented as trustworthy validations corresponds to the illusion that reductionist-deterministic science generates significant knowledge. This “data-and-experiment cult” is rather a component of the politics of science than an intrinsic part of it. Even generalizations built upon statistical averages and probability distribution defy the nature of the entity subject to knowledge acquisition. A doctor will not better address a patient’s health condition based on averaging. (The pitfalls of averaging are discussed in .) These are very concrete aspects of practicing medicine without looking through the “eyeglasses” of physics or chemistry. The patient’s unique profile should be the source for describing his condition. In particular, I would like to suggest the Anticipatory Profile . The living can be simulated by computation in a nonliving substratum only partially. The entire effort of embedding computation in artificial entities emulating aspects of the living (synthetic neurons, artificial muscles, synthetic DNA, synthetic cells, etc.) deserves respect for the gnoseological, scientific, and technological effort. However, the outcomes of the computation on such substrata can only reflectthe assumptions embedded in the emulated synthetic world. They confirm the physics of the living, not its specific condition. Let us end these considerations with one more observation: Physical and chemical processes have well-defined outcomes. Living processes have multiple outcomes, some antagonistic. It is a known fact that the same medication can be beneficial to some and (highly) detrimental to others: the “paradoxical effect” of medication. One discussion, going back to 1975 , deals with benzodiazemines, which trigger aggressiveness instead of acting as tranquilizers. The prevalent practice of medicine-as-deterministic—same drug prescribed ? same consequence—has led to serious repercussions in the very young and in the elderly (the two groups usually omitted from testing procedures) (Fig. 5). It would be naiÌˆve to believe that practitioners of medicine would from one day to another open up to the thoughts expressed in this study. The volume Anticipation and Medicine, the first on record on the subject, should help in providing reference material. It would be even more naiÌˆve to expect a rapid cycle of developing methods and means for an anticipation-grounded practice of medical care. The subject is more of economic, political, social, and cultural consequence than it is of science or technology. (The pharmaceutical industry has over one trillion products in the “pipeline.”) Having stated that physics-based medicine can unfold as fast as physical interactions, but that anticipation-guided medical care has the same rhythm as life, it is obvious that change, should it take place, will be slow, and will involve not only the medical profession, but also patients. Ultimately, this change is predicated upon a profound necessity: survival of the species. If this assessment sounds exaggerated, consider some of the facts discussed, and especially some of those only alluded to: degeneration of the species, of which aging is only a symptom; sexual conditioning (no longer related only to reproduction); spectrum disorders, the ever-growing catalog of morbidity, rarely only the product of better identification methods. As an endeavor endemically optimistic, science can only bring to society’s attention a worrisome situation, but cannot magically erase it—or postpone its consequences. The place to start for making possible the fundamental change suggested in this study is education. The continuing education of medical practitioners is part of the process. The real chance, however, to change medicine from a mechanistic reactive practice to a proactive, creative activity is connected to schools and universities, to the new generations. Education has to be reconceived from the ground up: solid scientific education in both the physics of the world and in the biology grounded in anticipation is required. This in itself is a high-order endeavor, since schools continue to indoctrinate new generations in the “religion of physics.” It is amazing that climate change associated with human activity is reduced to the physics of climate, where sustainability is a matter of choices, and improved technology, instead of being framed in the anticipation perspective: i.e., patterns of behavior, choices people make. Medicine was always the art and science of healing. The science became more and more a technology; the art was dropped altogether. If some medical practitioners are better than others on account of more than the equipment they have access to, it is considered as incidental. What distinguishes among doctors educated under the same circumstances (same medical school, same internship, etc.) was and should still be identified as talent. Society should offer equal access to medical care, but this social goal does not automatically qualify all providers as equally talented for the profession, or equally dedicated to it. To identify medical talent, dedicated to patient well-being, is a function abandoned, since medical schools are not really lacking applications and the medical establishment defends it turf (read: “return on investment”). Almost 100 years ago, Robert Lovett presented “A Plea for a More Fundamental Method in Medical Treatment” . We can repeat the gesture; we can even use his words, if indeed “Fundamental Method” would be understood as considering the human being from the complementary perspective of physics and biology established within the framework of anticipation. The goals are clear: consider the specific dynamics of the living. This will change the view on what diagnostics is, what it means to relieve suffering, how proactive medicine—maintaining health instead of patching what is broken—engage patient and physician, family, and community. All these amount to a tall order. The current profile of the physician mimics that of a data processing professional. Patients often mimic their doctors. But do-it-yourself medicine via access to information can sometimes be confusing. Nothing against the patient assuming an active role in healing, as long as it does not mean transferring responsibility (concerning how we live) to machines and chemistry. Family is today more an economic entity; so is community. Their role in addressing an individual’s health concerns is diminishing. Nostalgia for the time when doctors were “magicians,” when parents and children were subject to a bond that made the child’s suffering a family concern, etc.— illusions of wishful thinking realities—will not do. The answer is not in the past. And in the present, individuals are subjected to the enormous pressure of changes that on the one hand shape us more dependent on society, and on the other less responsible for our choices. It is in this context that the awareness of anticipation will heighten. Or else. Medicine can lead in the process, because after all is said and done, medicine is about life and death. The research reported herein took place between 2005 and 2015. Data was acquired in the AnticipationScope and in a variety of experiments using Microsoft Kinect. Among those who assisted during these years are the late Dean Burt Moore (School of Behavioral and Brain Sciences, UT-Dallas), Melinda Andrews, Dr. Navzer Engineer, Dr. Balakrishnan Prabakharan, Robert Fuentes, Dr. Gaurav Pradhan. The research was supported by the University of Texas at Dallas, TZI (Bremen Germany), and Microsoft. The author is indebted to the reviewers for their suggestions. 1 Nadin, M.: Anticipation and the Brain. In: Nadin, M.: (ed.) 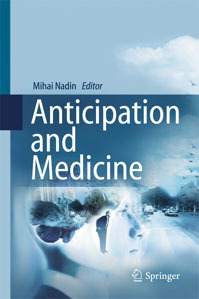 Anticipation and Medicine, pp. 135– 162. Springer, Cham (2016). 2Genetic manipulation of gene expression for turning mature cells into pluripotent stem cells brought Shinya Yamanaka a Nobel Prize in 2012. Nevertheless, physical-chemical manipulation has so far proven to be less successful. In 2014, he had to retract his findings. (See: http://blogs. wsj.com/japanrealtime/2014/04/28/japanese-nobel-winner-latest-to-apologize-over-stem-cellresearch/). 4Garzoni, M., Centomo, C., Avinash, M.V., Delledonne, M.: Next Generation Sequencing for Next Generation Diagnostics and Therapy. In: Nadin, M.: (ed.) Anticipation and Medicine, pp. 78–92. Springer, Cham (2016). 5Staiger, T.O., Kritek, P.A., Blakeney, E.L., Zierler, B.K., O’Brien, K., Ehrmantraut, R.H.: Implementing and Evaluating an Anticipatory Systems Model of Complexity for Improving Safety in a Healthcare Organization. In: Nadin, M.: (ed.) Anticipation and Medicine, pp. 27–36. Springer, Cham (2016).